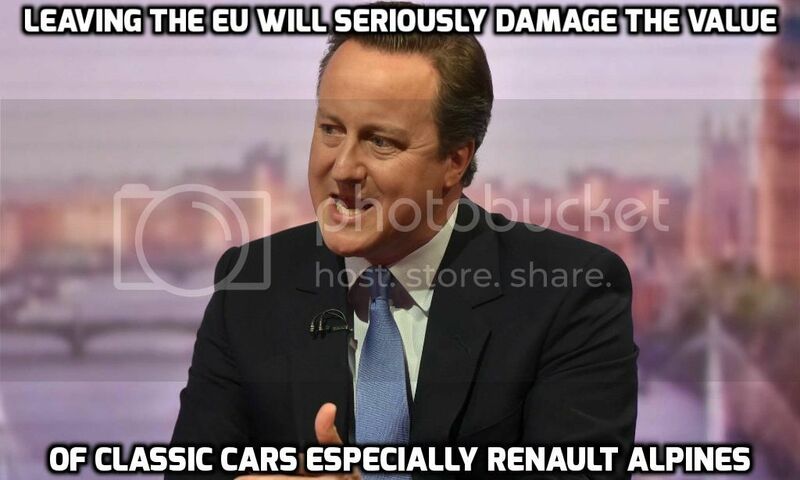 well he might as well have said this, its about the only thing he has'nt threatened us with if we choose to vote leave. only eleven days left to make up your minds, mine was made up a couple of years ago. LEAVE. please post your opinions, would be interesting and maybe help full. Unless leave has a large leed I think it will be vote leave for a yes. The stakes are to high it will start the end of the Eu. I think it will collapse within 10 years anyway as it will be bankrupt. Leaving will be expensive for us.......we just need to decide if we can afford it personally. Both sides have only campaigned negatively. "We should stay in because if we leave XXXXX will happen." The problem is that no one has a crystal ball and we could be equally in the mire either way. So are we stronger making our own decisions and paying for them or is the greater security in numbers worth the sacrifice in sovereignty? Matters no one iota in or out .The same people/lizards will be in control.The global economy will still dictate and that isn't concerned with localised politics or borders or sovereignty. No one for either campaign is giving much in the way of sensible reasons or actual examples for or against so hard to decide. Euro 6 ULEZ in London. If they could confirm this would be abolished that would be great but I suspect they will just keep it anyway or something worse. If someone in power had the bottle to say no more immigration like they said no to the euro I don't think we would even be having the debate. I think leavers will make more effort to vote and remainers and undecideds won't bother so much and that will likely swing it. Only sensible thing someone said to me was if you stay you know exactly what you are getting. Anything else is a leap in the dark. So guess it's down to whether you are happy with your current lot and if not it's a gamble on being better or worse off. I've been watching this debate play out in my Facebook feed which I guess means I have a balanced set of Friends. Doesn't seem to be much rational argument going on, just assertions about how strong we will be outside and how much money we will save set against the same assertions on the other side. What's more disturbing is when you look deeper into who is doing all the shouting on both sides and their motivations.. Personally I'd vote for keeping RAOC neutral so I have some where to go and escape all the "debate/shouting at each other"
Everywhere else is worse than new top gear (although I did think the South African trip segment wasn't too bad last night). Saw ken blocks Hoonigan at the festival of speed last year. It's utterly insane. It sounds like armageddon.